The Strokes join headliners Blur, Kylie Minogue, The Who and Taylor Swift for the event of the summer, with more to be announced. 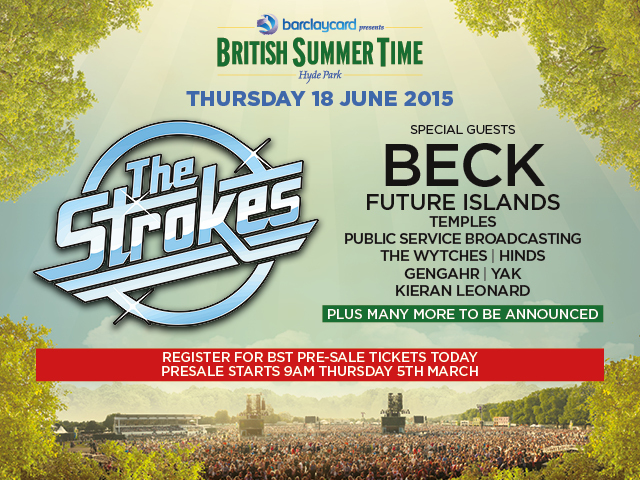 THE STROKES, one of indie rock’s defining and most influential bands are the fifth headliner announced for Barclaycard presents British Summer Time Hyde Park 2015. Since their 2001 debut, THE STROKES have been a musical inspiration for the UK’s best and brightest. They have been cited as triggering a sea change of mainstream culture. It is a testament to their influence that the likes of the Arctic Monkeys, Adele, The Killers and many others have covered their work. They have sold over 5 million albums. The Strokes’ debut album, Is This It, met wide critical acclaim, and was ranked #5 on NME‘s 500 greatest albums of all time, #8 on Rolling Stone’s 100 Best Debut Albums of All Time, and #2 on Rolling Stone’s 100 Best Albums of the 2000s. Very special guest is the Grammy Award winning BECK. Since his worldwide smash “Loser” in 1994, Beck has gone on to release 12 albums and is now considered to be one of the greatest modern songwriters of his generation. 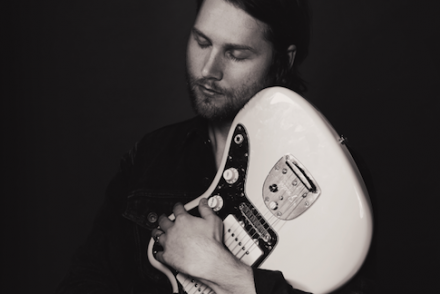 In addition to recording his solo work, Beck is also producer and collaborator to a wealth of artists as diverse as his songwriting, including: Childish Gambino, Sia, Charlotte Gainsbourg and Bat For Lashes. Last year saw him release his latest album “Morning Phase”, to widespread critical acclaim, and was crowned Album of the Year and Rock Album of the Year at this year’s Grammy Awards. Joining The Strokes and Beck are FUTURE ISLANDS. With their stand out track ‘Seasons (Waiting On You)’ topping NME, Pitchfork, Spin, Consequence Of Sound and Guardian’s “Track Of 2014′ list, they make a triumphant return to the main stage, following their spellbinding performance at last year’s Barclaycard presents British Summer Time Hyde Park. The full supporting line up also includes: Temples, Public Service Broadcasting, The Wytches, Hinds, Gengahr, Yak and Kieran Leonard. Other headliners already announced for Barclaycard presents British Summer Time Hyde Park are Blur on June 20th, Kylie Minogue joined by Grace Jones and Chic feat Nile Rodgers on June 21st, The Who, with Paul Weller, Kaiser Chiefs and Johnny Marr on June 26th and Taylor Swift, joined by Ellie Goulding and John Newman on June 27th. AEG Live, The Royal Parks and Barclaycard are proud to present the third year of this unique and world-class event. Having royally entertained hundreds of thousands of fans over the past two years, 2015 will be no exception. As well as the huge ticketed headliners, the midweek activities will return with free access for park visitors to enjoy film, music, sport and literature. 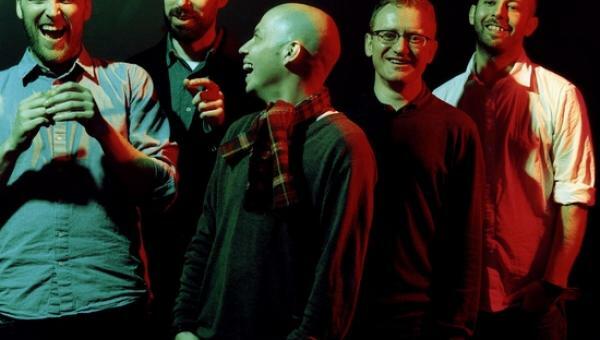 NME premieres video for “Coat of Shellac” taken from Ava Luna’s Infinite House!